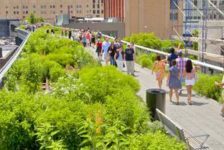 Landscape architects — like many designers — regularly engage with what are commonly called ‘wicked’ problems. Wicked not in the sense of evil, but in the other definition: a problem that is difficult or thorny due to incomplete, contradictory, and constantly changing information, and requirements that are hard to recognize. 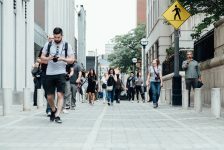 Urban overcrowding, climate change, economic disparity, and inequity in green space access – wicked problems, all. As designers, we hope and expect to not only be able to conquer wicked problems, but also manage to create works of sublime beauty that are a pleasure for people to occupy and use. Ian McHarg’s influential 1969 Design With Nature focused attention on the then relatively-new idea that we shape the earth best when we plan and design with careful regard to both the ecology and the character of the landscape. In Japan, meanwhile, the importance of listening to and taking lessons from nature had been in practice as early as the eleventh century, as can be gleaned from the medieval garden treatise Sakuteiki. Listening to nature now also includes perceiving the signs of climate change. This was an important component of the Portland (Ore.) Japanese Garden’s 2017 expansion project, for which the Tokyo architecture firm of Kengo Kuma and Associates created a LEED-certified complex of buildings inspired by traditional Japanese architecture. The Garden sits nestled in the West Hills of Portland, overlooking the city and providing a tranquil urban oasis for locals and travelers alike. Designed in 1963, it encompasses 12 acres with eight separate garden styles, and includes an authentic Japanese tea house, meandering streams, intimate walkways, and a spectacular view of Mt. Hood. The new Cultural Village — a complex of buildings and courtyard with a modern interpretation of Japanese architectural tradition — is a place where visitors can immerse themselves in a variety of programs in traditional Japanese arts. It is indeed a thing of sublime beauty. 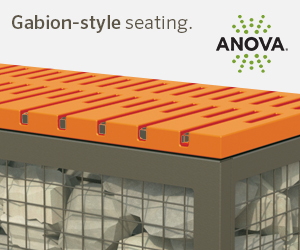 But it also represents design in collaboration with nature: large sliding window walls allow access to light and fresh air, living rooftops made of porous thin ceramic tiles decrease runoff and contribute to the buildings’ climate control, and geothermal-powered hydronic radiant heating minimizes the need for energy to heat and cool the buildings. The top of Sadafumi Uchiyama’s dry creekbed, which channels runoff from the Portland Japanese Garden to a concealed holding tank. Photo courtesy of the Portland Japanese Garden. Garden visitors arrive at the Welcome Center at the bottom of a steep hill, and ascend the hill either on foot or by shuttle to reach the Cultural Village before continuing to the five traditional gardens. The former includes a small urban courtyard garden, a castle wall constructed by a fifteenth generation Japanese stonemason, and a bonsai collection. 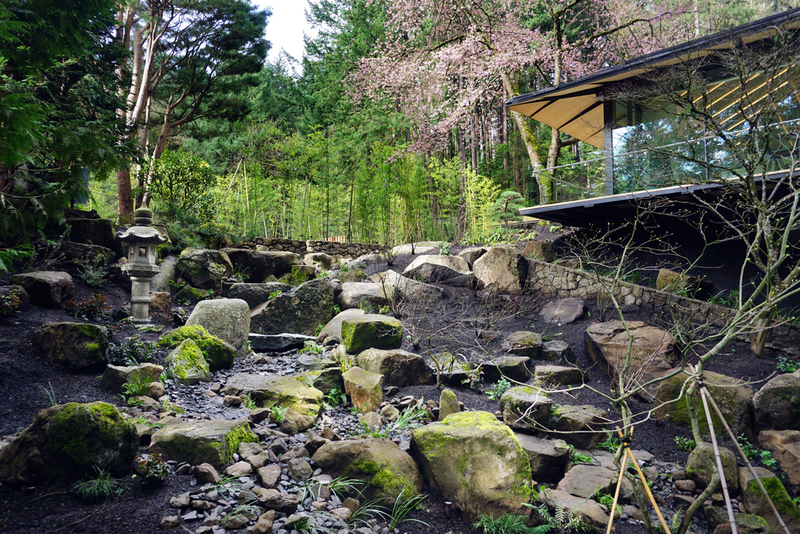 The expansion project also transformed the hillside into an essential part of visitors’ experience of entering the Garden. Work on the hillside included removal of invasive species and native plant restoration, but its most significant transformation focused on water management. Garden Curator, landscape architect, and fourth-generation Japanese gardener Sadafumi Uchiyama designed a green infrastructure system rooted in Japanese stone-setting tradition. A stone creek bed runs from the top of the hillside all the way down to the parking lot, channeling and filtering runoff down the hill while serving as a striking linear element visually connecting the upper and lower Garden areas. Water goes into a nearly 27,000 gallon holding tank under the parking lot and is slowly released into the city’s combined storm water and sewer system. 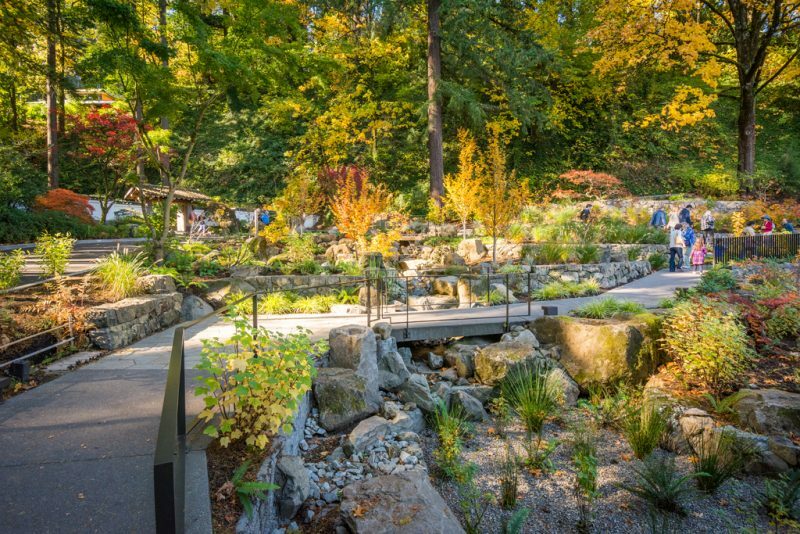 To the Garden’s nearly half-million annual visitors, the creek bed is an aesthetically pleasing design element of the Garden. But it’s also a critical piece of infrastructure. Projections show that annual precipitation will increase in Oregon mostly during the cold weather months, and future precipitation patterns are also estimated to be more unpredictable and extreme than in the past. The Willamette Valley’s typically dry summers and wet fall, winter and early spring months will likely become even more so, meaning summer water scarcity and significantly higher levels of runoff the rest of the year will become the new normal. The creekbed is part of visitors’ experience entering the garden from the Welcome Center below. Photo courtesy of the Portland Japanese Garden. If Uchiyama was calling upon centuries of Japanese gardening techniques and a tradition of living as one with nature to address a water management problem in 21st century Portland, the current flows the other direction as well. In 2014, a Japanese delegation came to study Portland’s green infrastructure system with the hopes of advocating for the development of similar green infrastructure policy back in Japan. Interest in ecosystem-based disaster risk reduction has increased dramatically in Japan since the 2011 earthquake and tsunami. What does all the above teach us? We need not just to listen to nature, but to each other. Good ideas flow across national borders and through the ages. For every wicked new problem designers have to wrestle with, there is someplace in the world where someone has had to deal with that same problem for a long time — and out of necessity found resourceful and even beautiful ways to cope with it. 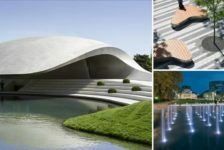 Think about thousand-year-old earth-sheltered houses in China, passive solar heating ideas used 900 years ago by the Pueblo Indians, and modular building techniques used in Japan for half a millennium. India has an entire vocabulary of different structures for capturing and storing precious rainwater going back centuries, and scientists recently rediscovered a 700 year old African technique for soil enrichment unmatched by any modern technology. For some disciplines, there’s a more or less agreed-upon, standard canon of required, fundamental works of literature. This is not the case in landscape architecture. Ask ten landscape architects to name their essential readings and you’ll have ten different lists with minor overlap — there are myriad worthy works both classic and new. But it’s entirely possible that in the 21st century, for a landscape architect, the most essential textbook is a well-worn passport. Japan Ministry for the Environment, Nature Conservation Bureau. 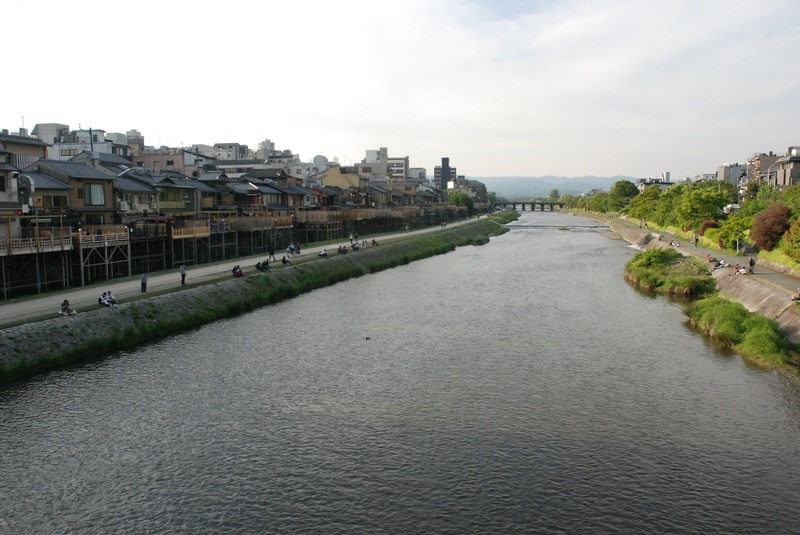 Ecosystem-based Disaster Risk Reduction in Japan: A Handbook for Practitioners. 2016. McHarg, Ian. Design With Nature. Wiley, 1969. Interview with Prof. Arno Suzuki, Kyoto University, May 16, 2018. Taylor, John S. Commonsense Architecture. W.W. Norton, 1983. Kristin Faurest is the director of the Portland Japanese Garden’s International Japanese Garden Training Center. The Center teaches traditional skills and techniques for creating and fostering Japanese gardens — while acquainting learners with the garden’s cultural heart and soul. 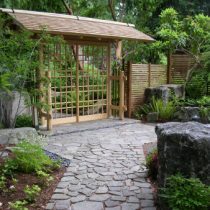 Its educational programs support authenticity and adaptation for Japanese gardens outside of Japan, and the use of Japanese techniques to create restorative, sustainable spaces. Programs include hands-on educational opportunities for learners of all levels in the art of the Japanese garden, including the Waza to Kokoro: Hands and Heart professional-level seminar in Japanese garden arts. This year’s seminars take place June 3-9 for beginner level and Sept. 16-27 for intermediate level. 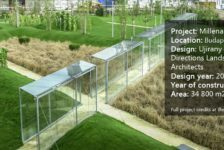 Application is now open to landscape professionals of all sectors. For details on the seminar or other Center programs, go to: japanesegarden.org/thecenter or email kfaurest@japanesegarden.org. The Center is a recipient of the American Public Gardens Association’s 2018 Award for Program Excellence and is supported by the Japan Foundation Center for Global Partnership.